What makes D.K. Metcalf so intriguing is his size. Compared to the wide receiver mean, he’s tall, big, has a towering wingspan, tree trunks for arms and has better than average hand size. He is überfast and is explosive. However, one thing he is not is agile. His Three-Cone and 20-Yard Shuttle were so bad that his 11.88 Agility Score places him in the 4th-percentile. Although Metcalf’s 32.1-percent College Dominator is above average (58th-percentile), what is most concerning is the fact that he only has 67 receptions to his name. There is a possibility that this athletic phenome might turn out to be a colossal bust. Matt Lacosse and Jacob Hollister are not draftable Gronk replacements. Treat Tyreek Hill as if he is radioactive until further notice. Sammy Watkins has not been efficient since 2015 and that matters. Chris Conley’s squandered 2018 season was unforgivable. 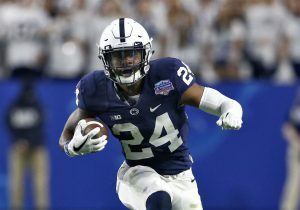 Miles Sanders has the best athletic measurables across the board. He has receiving capabilities at 211 pounds. Sanders flashed his upside his junior year, rushing for 1,200 yards and catching 24 balls and has proven he can handle a significant workload, averaging 18.7 touches per game in 2018. Miles Sanders has the best athletic profile in the 2019 running back class across the board, because he possesses an all-purpose skillset and has the best shot at becoming a bell-cow back at the next level. Ty Johnson is the best sleeper running back in the NFL Draft. Darrin Hall, Jeremy Cox, and Kerrith Whyte are highly athletic no-name college running backs. Mel Kiper thinks Terry McLaurin is a first rounder! You know who has outstanding comps? Scott Miller from Bowling Green. The Jacksonville Jaguars spent the fourth overall selection on Leonard Fournette in 2017. After the 2018 season, with Fournette still on the roster, they have a whopping 59.3 percent of their total carries left up for grabs. 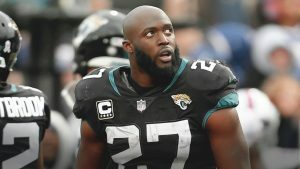 Fournette looks like the biggest winners of the still young NFL offseason. Chris Warren led the NFL in rushing yards during the 2018 preseason, racking up 292 yards on 58 attempts. However, his underwhelming 16.2-percent College Dominator Rating on 8.5 rushes per game for Texas combined with lackluster athletic profile suggests Warren is incapable of shouldering a primary back workload in the NFL. Remembering Rob Gronkowski with a party. What should fantasy gamers be doing with Tyreek Hill this offseason? Time to hope onboard the the Sammy Watkins train? 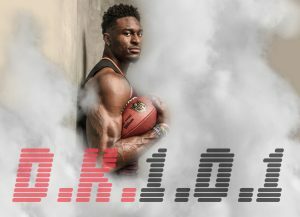 Jerick McKinnon will make $3.7 million this year, and it doesn’t matter. Riley Ridley’s draft stock has taken a nosedive after the NFL Combine. He posted poor athletic metrics across the board to pair with his minimal college production. With no redeeming qualities on his advanced metrics profile, Ridley will need to convince NFL teams that his routes are so good that they can ignore all the red flags. 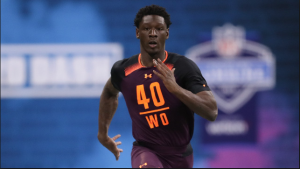 Players like Ridley should never participate in the Combine as it only stands to hurt their stock. Either his agent doesn’t own a stopwatch or he is naive. He should be relieved of his duties for purposefully plummeting his players stock. How much would Sammy Watkins benefit from a Hill suspension? Route running savants on Twitter dare to critique Parris Campbell’s route running. Did Campbell and Terry McLaurin prop up Dwayne Haskins? How Josh Jacobs flamed out at his pro day. Devin Funchess is the same height as Ebron but with a far superior Catch Radius. Funchess should also outperform Ebron in the red zone because he has better burst and can get off the line and create separation more quickly. 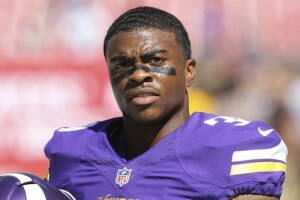 Jerick McKinnon is the highest-profile incumbent loser in free agency because his value peaked after free agency last year at an early third round start-up pick, but there are other situations worth taking a closer look at as well. 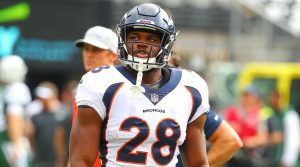 Royce Freeman has a long way to go to be considered an elite workhorse back, but he has the athletic profile and past college production to make it happen. Freeman delivers excellent size-adjusted speed and quickness. Couple this with above average college production, and Freeman has all the makings of a bell cow running back. Chris Carson was the back to own in fantasy last season, but his success was largely volume driven. A closer look at some of the advanced efficiency statistics at PlayerProfiler indicate that the two running backs performed similarly on a per-touch basis.